Where Are the Walks Happening? We are excited to begin planning for 2019. Our hope is to have many more walks happening around the state. We’ll also be making a concerted effort to ensure a wide array of walks accessible for wheelchairs and strollers – a Walk and Roll in Penn’s Woods. If you’re interested in hosting a walk in 2019, registration for hosting a Walk in 2019 is open. Click here to add yours. Walk Description: Talk a Walk and learn about tree planting and harvesting. Leashed pest are allowed, owners must cleanup after their pets. This Walk is not wheelchair or stroller friendly. Greendale Cemetery – Walk starts at 9a.m. and ends at 12p.m. Walk Description: Explore Greendale Cemetery gorge to view some of the larges, tallset trees in the area. The terrain will be challenging and difficult at times but totally worth it! People friendly leashed pets are welcome, owners must cleanup after pets. This Walk is not wheelchair and stroller friendly. Walk Address: Back Road, Powell’s Valley, Halifax, PA Directions: From PA 322/22, take PA225 north for 4.5 miles. Just before entering the Village of Matamoras, turn right on Camp Hebron Road and follow it for 4.5 miles. The conservation area is on the right. 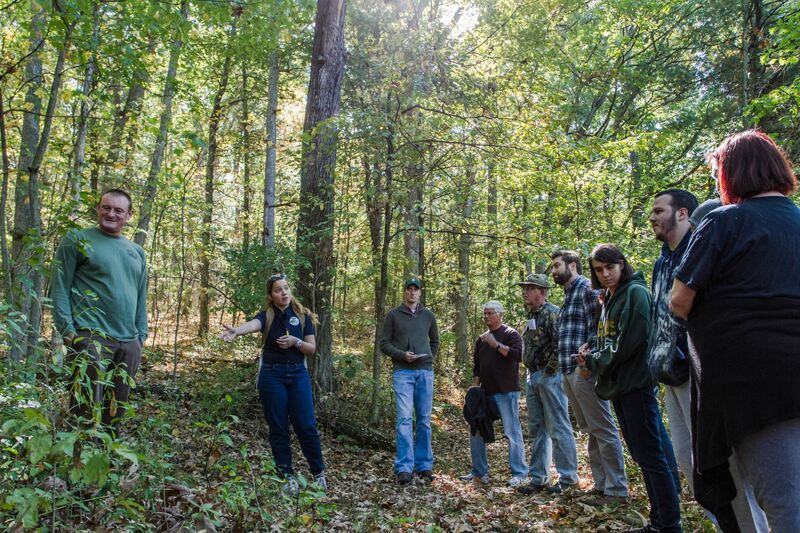 Walk Description: The Dauphin County Woodland Owners (DCWOA) Association and the Manada Conservancy will partner and co-sponsor it’s 3rd annual Walk in Penn’s Woods. This guided 1.5 mile walk will explore the Ibberson Conservation Area-East, located along Back Road, Halifax, PA, 17032, in scenic Powell’s Valley. This beautiful conservation area is home to abundant wildlife, unique aquatic features,public land, and clean water. Nature will be observed at its finest with a Manada Conservancy field expert to identify birds, wildlife,flowers,and invasive species. Tree ID, silvaculture, and forest health will be discussed along the way with a DCNR Service Forester. Walk participants are advised to wear well-fitting sturdy shoes or boots. Terrain may be uneven and there are moderate inclines. We will meet in the gravel parking lot at the Ibberson Area Trail Head. This program is free and open to the public. Registration is respectfully requested for planning purposes by contacting the Manada Conservancy office at 717 566-4122, office@manada.org. DCWOA and Manada Conservancy will be providing water for hikers, and participants are encouraged to bring along a refillable water bottle or cup. This Walk is not wheelchair and stroller friendly, please leave pets at home. Walk Description: Join us for a 2 mile round trip walk. Enjoy level and leisure terrain. Participants will view the Swatara Creek from an architecturally distinctive bridge. Wheelchairs and strollers are welcome. People friendly leashed pets are allowed, owners must cleanup after pets. Perry County – Takach Property – Walk starts at 2:00 p.m. and ends at 4:00 p.m. Walk Description: We will briefly discuss how to start a Hunter Management Plan and then meander the property in search of animal sign. This event is appropriate for families with children capable of walking the distance. To register email Deb Takach at duncannonatc.org. This Walk is not wheelchair or stroller friendly. People friendly leashed pets are allowed, owners must cleanup after their pets. Pike County – Stairway Ridge – Walk starts at 9a.m. and ends at 12p.m. Walk Description: Join the Delaware Highlands Conservancy and the DCNR for a guided fall hike on this protected property and the adjacent Stairway Wild Area. Remember to wear hiking shoes, comfortable clothes, and bring water for this moderately strenuous trail. This event is free and open to the public, but registration is required. Please contact info@delawarehighlands.org or 570-226-3164 x 6 to register and receive directions to the meeting location. This Walk is not wheelchair or stroller friendly. People friendly leashed pets are allowed, owners must cleanup after their pets. Walk Description: We are working on which trails to share. A description of the Walk is coming soon.